I’ve been saying for a while now that the construction sector is under pressure – there are too many people wanting things built, and not enough builders to do the work. That’s a simplistic view, as construction companies can put in overtime, hire more people from overseas, or look for more efficient ways to build. But we’re certainly at a point where builders are very busy, and where we can’t speed up the rate of building much faster without it causing major cost increases. Props to my coworker Sarah for making this cool image. Housing Minister Nick Smith… said the building industry had now used up all its spare capacity and faced serious constraints with skilled labour, materials and equipment. “In terms of the supply of tilt slabs for apartment buildings, the sector is so overwhelmed with orders that they have to go outside Auckland to get product delivered for as long out as February next year,” he said. He said Auckland Council was also struggling to get staff to process consents and inspect new buildings. Let’s start with a graph showing the amount of work builders do each year. It’s in “volume” terms, which means that it’s adjusted for price changes. So the graph is really saying that in the last year, builders across New Zealand managed to carry out a larger “volume” of work than they ever had before, although only slightly more than in the 2004-2007 period. Note another interesting feature of the NZ construction industry – there are huge swings in the amount of work undertaken in ‘good years’ (economy going well, everyone happy, la di da di da) versus ‘bad years’ (recession, development dries up, mass layoffs, firms go bust). Although there’s strong industry support for government taking a role to smooth out this pattern – i.e. investing in new state houses, schools, roads etc when the economy is weak – we have a pretty poor track record with this in New Zealand. 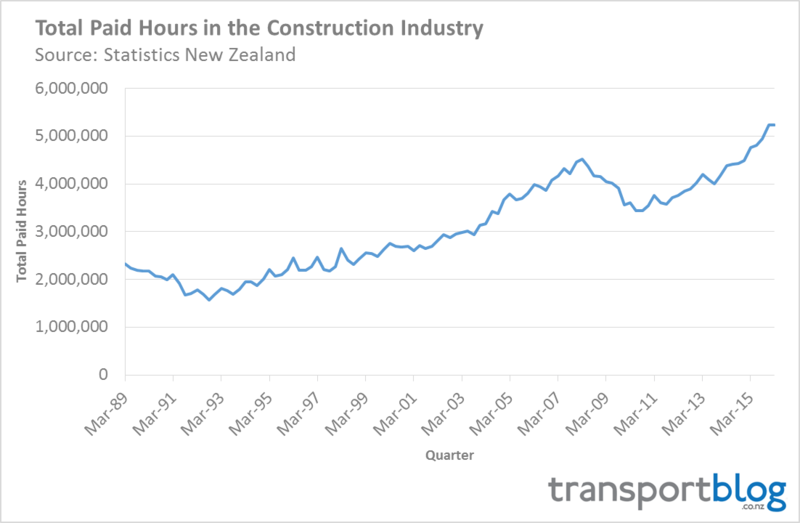 Here’s graph number 2 – this one showing ‘total paid hours’ in the construction industry. Data source is the Quarterly Employment Survey, which asks a sample of firms around the country how many hours their employees worked each quarter. This one is even more stark, showing the industry now putting in a lot more hours than it did in the 2007 peak. Other sources show a similar picture – the Household Labour Force Survey estimates that there were 195,000 people working in construction in the 2007 peak, which fell as low as 165,000 during the recession, and has now risen to 230,000. Lastly, a graph on “real” construction prices. This graph is indexed for inflation, so if the lines are horizontal it means that prices are flat in real terms. If the lines are sloping upwards, it means construction prices are going up faster than general inflation. Interestingly, ‘non-residential buildings’ are still hovering at around 1,000, i.e. they’ve grown at about the same rate as general inflation over the last 25 years or so. ‘Civil construction’ started to get more expensive in the early 2000s, and has kept on trucking slowly upwards since then. But the real action has been in ‘residential buildings’, which seem to have bursts of rapid inflation, followed by staying flat for a while (or even reducing after the GFC). Prices have been rising strongly in the last few years – 4.6%, 5.0% and 4.5% in the last three years, whereas general inflation has only gone up 1.5%, 0.3% and 0.4%. So if you’re thinking about adding a new rumpus room… maybe think about holding off for a couple of years. The main issue seems to be a shortage of workers, more than a shortage of materials (although that will be biting too). It’s particularly unfortunate that construction fell away so much in 2008-2011 – it’s left the industry poorly prepared to cope with the current boom. Taking another step up, even just from 230,000 workers to 250,000 say, will be tricky. Yes if National had undertaken a building programme in Auckland in 2009 to replace an additional (to what they actually did) 2000 state houses per year for 3 years then that would have kept 5000 or so builders etc in work over that period (rather than leaving the country or becoming unemployed etc) so that we would have those extra hands on deck now. It would have also meant that there would be around 5000 more houses in Auckland (6000-1000 removed since new builds are higher density rather than large 1/4 acre sections). There would also be less need for these to be built now during the boom freeing those builders etc up for other buildings. John a factor not taken into account is the changes in building regulations and the time and cost implications from those regulations. Certainly each house build is more complicated and expensive per square meter than in 2007 and prior. This means we get less houses for each builder and it is more expensive. This reality is hidden to a partial extent by more basic houses being built to combat the xtra time and materials required to comply with new regs. Ding, Ding. We have a winner! Between that and the lack of competition in materials supply it’s no wonder we’re screwed. Leaking homes is the reason for regulations and the pasting councils have taken on compensation. Everywhere is renovations going on leaky buildings, a stark reminder from the golden age of Nationals deregulation brain fart building industry of the 90’s. Even now there looks like some questionable places being built at the moment, dodgy base materials, lack of objective oversight on where they are coming from. Less regulation is not the answer. Cladding is but one part of the building process. Easily resolved by removing certain deficient materials from the market (which should never have been allowed to begin with). So, tell me, how does scaffolding to a single story building enhance the ability of the cladding to resist water entry? Nice half truth bro. You got any reality to base the scaffolding claim on? The reality of every new build I’ve been involved with or have seen. How’s your reality bro? Yes in Millwater there are now lawsuits going on because houses built by a certain nationality used dodgy wiring. There are also houses built there that are leaking already, don’t have rebar in the concrete base pad, have had the insulation removed from where it is supposed to be and many other shortcuts taken (things like wonky down pipes etc). More oversight is needed but at the same time less red tape is also needed for good builders. Perhaps they should have some kind of rating like restaurants have. Yes Bruce. But these things have always occurred and stories abound of missing/shifted to the next hole reo etc. I’m not sure it’s actually any worse now then 50 or a 100 years ago. I’ve seen and fixed some really shoddy villas too. I’m also not sure how you go about fixing it either since regulation doesn’t seem to work too well. The biggest dead weight loss has been cell phones. If you hire a builder s/he will spend as much time on the phone as actually building. To be fair, anything Nick Smith says should be taken with a grain of salt! John you are making the same mistake as Nick Smith by presenting national figures to explain the lack of progress in tackling Auckland’s housing crisis. 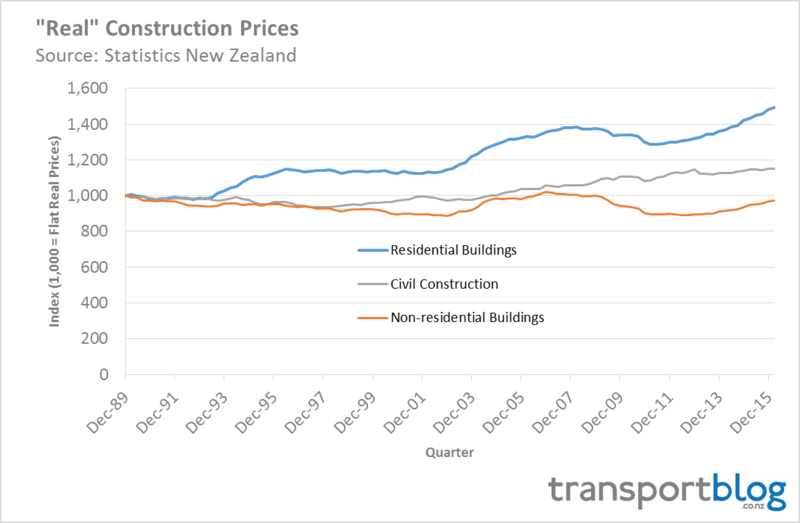 What you need to do is show building consent numbers per capita (per thousand) for Auckland and Canterbury, going back to at least the 90s to show how the different provinces construction cycles have responded to events. Both places have had demand shocks -one by a series of earthquakes. The other due to immigration and natural population growth. Canterbury is building its way out of its demand shock. Currently building in excess of 500 houses per month if you check Statistic NZ monthly consent figures. These figure are well in excess of earlier booms. Canterbury has found labour (more local than widely assumed), capital (new factories like Concisions) and affordable land (more dispersed than I would prefer). What we did wasn’t perfect -it could have been more affordable and less dispersed and it took a few years to ramp up, but in the end there was a supply response which stabilised the housing market. Auckland has not built itself out of its crisis. Despite being triple the size of Canterbury, it is building less than double the amount of household dwellings. I cannot see why Auckland should have labour and capital shortages when Canterbury does not. I think the more likely explanation is the third factor of production -land. Auckland’s geography, zoning -the Super City means there is no easily accessed alternative neighbouring Councils with spare infrastructure capacity and the fact that all the easily accessed sprawled locations have been taken means Auckland’s land supply is much tighter than Canterbury’s. Urban land prices are higher and in the grip of a speculative bubble -further reducing supply. Auckland’s housing/construction sector is a mess and there is a lot of people with their head in the sand -especially the Minister of Building and Housing -Nick Smith. Canterbury did have major labour and capital shortages when the earthquakes hit – it took a few years to get on top of, and even so construction (and house) prices have escalated very significantly in Christchurch since 2011. The problem is, Canterbury is still very busy, but now Auckland needs those builders too. This will hopefully come right over the next couple of years, as the overall workforce grows and as the Canterbury rebuild starts to tail off, but it won’t be overnight. Why will Canterbury’s construction sector slow down? The residential insurance payout rebuild peaked a year or so ago -but residential construction rates remain fairly stable. Because of the cheaper land factor -houses are being constructed at 2/3 of the cost of Auckland? Given this why would economic forces mean Canterbury’s construction workforce moves north to Auckland when just as easily immigrants could move south to Canterbury? As to my wider question John. Why don’t you put up some regional graphs to show what is happening in different parts of the country? I do regional graphs (for Canterbury at least) in the “development update” posts every now and again, I’ll most likely have it in the next one, which will go up in early July. Auckland and Canterbury are the main stories from a building point of view, although proportionately there’s also a lot of growth in Waikato and Bay of Plenty now. The reason I expect the Canterbury construction boom to tail off (like most commentators) is that the rebuild will come to an end, and I’m not convinced that anything about Canterbury has changed structurally to give it higher long-term growth rates since the earthquake. At the moment, the amount of building in Canterbury is higher than it has ever been, much higher than it ever was before the quakes. And quakes don’t help economies in the long term. Unless other things have changed, which I think is possible but very unlikely, I’d expect that Canterbury will go back to more like its historical levels of building activity. It would be interesting to look at the last construction/immigration boom, which from memory was in the early 2000s and see where Canterbury and Auckland are in comparison to those times on a regional per capita basis (per 1000). That would give us an indication of where Canterbury will drop down to and how far Auckland needs to ramp up to. What’s more likely, tradies come to Auckland with developers who pay top dollar, or Government Anchor projects that may not even happen. Canterbury has large Asian community’s, so foreign immigrants of all types do come here too. 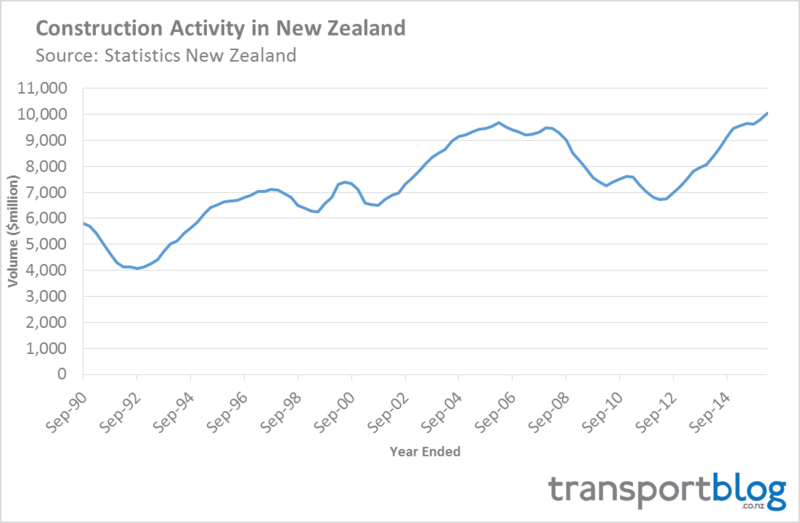 Population growth wise Canterbury has less natural population increase and overseas immigrants than Auckland but this is partially offset by in recent decades, except for immediately post earthquakes, Canterbury receives more internal migration than Auckland does. When Peter Nunns looked at population growth in Canterbury the biggest difference with Auckland was during economic downturns more people left. On a per capita basis the booms in Canterbury are comparable to Auckland’s. The busts seem to hit harder though. I think confidence and identity is more fragile down here and reflects the less national attention we get. Transport wise the country has underspent in Canterbury for decades and the region is due some major infrastucture upgrades -hopefully a system of rapid transit. This would greatly assist in improving our identity and confidence. Christchurch could easily become an attractive mid size international city. Brendon, having experienced the quality of road condition in both places, you’ve done better on that score than Auckland, at least. Shame the rebuild didn’t include more rail and bus infrastructure. You are right, Auckland does have costs structurally higher than other parts of the country. However these are not due to physical constraints. There is an awful lot of easily accessible land around Auckland that the current council has simply chosen not to use, but councils do change. Maybe the next council will be less parsimonious with respect to development of urban/suburban Auckland. In the meantime we are seeing a real lift off in the amount of building occurring in the exurbs of Warkworth, Silverdale, Pukekohe and Kumeu. Also soon Clarks Beach is scheduled to triple in size. All the faraway places where Auckland Council has lavished infrastructure spending are growing gangbusters. It is merely Auckland City that is lagging behind. Maybe if New Zealanders were trained and paid a Living Wage we would not need to import foreigners to steal our jobs and live in our houses. Anecdotal, but from a developer: prices for units advertised in January had to be raised significatnly by April because of movements in construction cost in that time. Competitive market. If you have a look at the type of houses being built in Auckland it is easy to see why the cost average costs are going up. Gone are the days of the cheap and cheerful group-housing type of home which featured in merging suburbs until quite recently, to be replaced by architectural masterpieces probably with price tags to suit. I was working on infrastructure in a South Auckland suburb recently where there was a neighbourhood of simply massive six bedroomed houses being built. And if you are wondering where all the tradesmen are going you only have to look at the major infrastructure projects such as the Waterview Tunnel, Kirkbride Road, Hunua 4 pipeline, and soon to be started Central Rail Loop and new sewerage tunnels, as well as the big commercial developments in downtown. Those projects swallow up the trades; and why shouldn’t they. A steady income for the length of the project isn’t something to be ignored. Maybe we should legalise those tiny homes & allow modular building allowing cheaper alternative quick builds. My father was a carpainter, and my apprenticeship in the printing trade was arranged through a family friend while I was still at school (1960). In those days kids at school were encouraged into trades, and scholastic achievements such as School Certificate were not a requirement. Fast forward to my own son and I encouraged him into a trade (fitting and turning) while he was still at school, and his formerly hoon Westie mates are also tradesmen, now with their own businesses. Now his 12 year old son has his path into a trade set up with one of my son’s mates. However, talking to many modern tradesmen, it is a wonder they entered the trades at all, taking into account the almost hostile view of trades by many in the teaching profession. However, it is tradesmen who are having the last laugh, because plumbers now rate higher than doctors when it comes to annual average earnings.